In the busy world of social media, do you sometimes forget how you connect with people? Is it a suggested follow? Someone who engages with you? A witty or interesting share or retweet from one of the your other friends? I can’t remember when or through who I met Ranee but somewhere along the way I did and we started chatting and slowly struck up an internet friendship. Ranee is Ranee Veerassamy from Mauritius via Seattle and she runs Rani’s Cuisine. Internet life crossed into real life when I went to one of Ranee’s tasting parties to try her latest products. Mauritius is a small island nation floating blissfully in the Indian Ocean, to the east of Madagascar which is in turn east of the African mainland. Like many countries in that part of the world, it has a colourful history of explorers, invading armies and colonial rule, pirates, slavers and traders. These influences have created a melting pot of flavours. Mauritian cuisine is an exciting mix of Indian and French with a little bit of Creole and Chinese thrown in for good measure. Almost every dish starts with the classic combination of garlic, red onion and chillis with ginger a popular addition. I asked Ranee what bought her to Australia and she told me that whilst she had enjoyed living in Seattle, there were some aspects of the culture that she didn’t want influencing her young family. With the economy slowing, she and her husband decided to make the move to Australia, selling their house just a week before the GFC hit. Talk about timing! 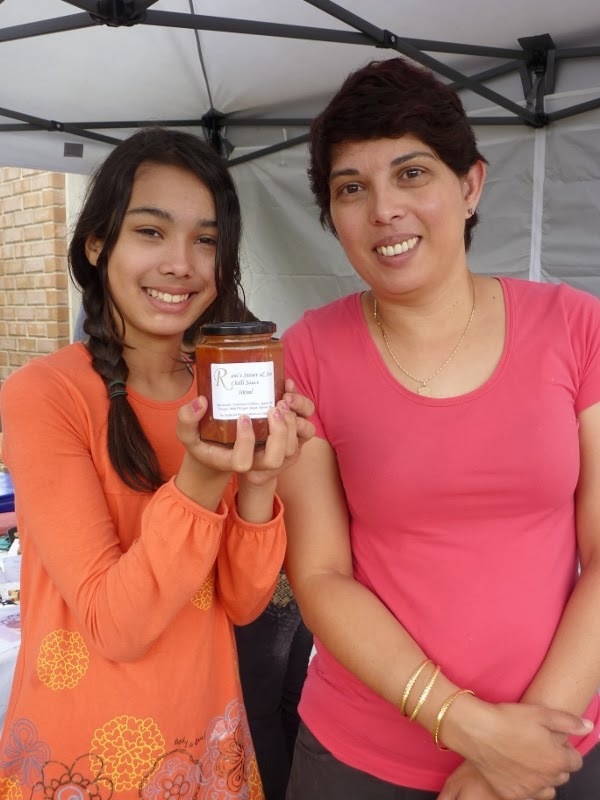 They’ve put down roots and intend to stay in Australia so Ranee has turned her hand to creating a business based on the tastes of Mauritius. 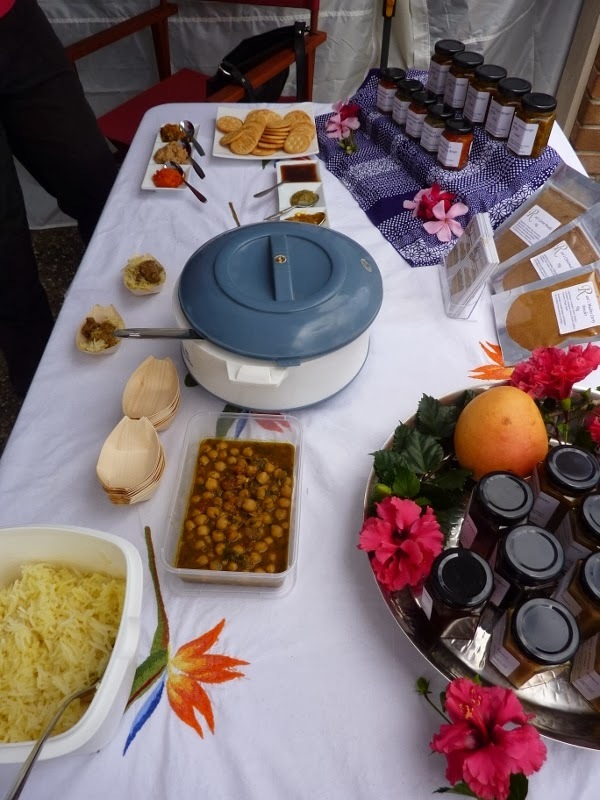 On taste at the party was a selection of chutneys, relishes such as the famous Piment Limon Vert and sauces including a Tamarind and a Chinese influenced Sweet & Sour Chiili. All items are made by hand in a commercial kitchen. Ingredients are seasonal and fresh. In the days before the tasting, I had seen photos of Ranee and her daughter (who had been pressed into service), harvesting small green mangoes from a neighbours tree. Spices are ground just before they are added to pot and the resulting mango pickle is sweet, tart and a little crunchy. Very refreshing and sure to perk up any dish. Ranee told me that she always brought this pickle back to the USA with her after visits to Mauritius. That’s not so easy to do with Australian quarantine rules so she managed to convince the recipe owner to share it with her so she could make it herself in Australia. 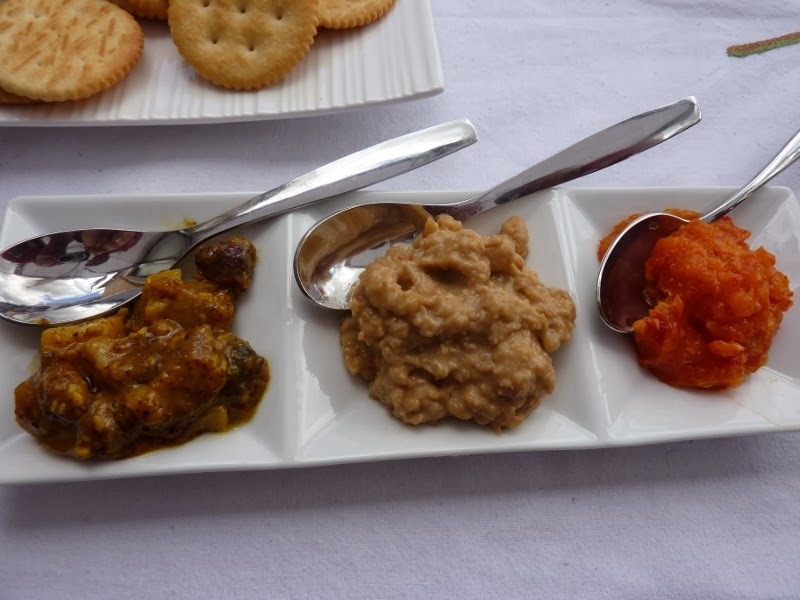 The mangoes used in Mauritius are different to those available here so Ranee experimented with several mangoes before finding the right variety for the pickle. It’s that care and attention that makes the small batch recipes so good. Also on taste were sorbets and ice creams (that’s the French influence) such as Burnt Butter Caramel and Ginger and Lychee – fragrant and refreshing. Ranee is growing her business in a variety of areas including cooking class parties and, in 2014, public classes at several locations in Brisbane and the Sunshine Coast. 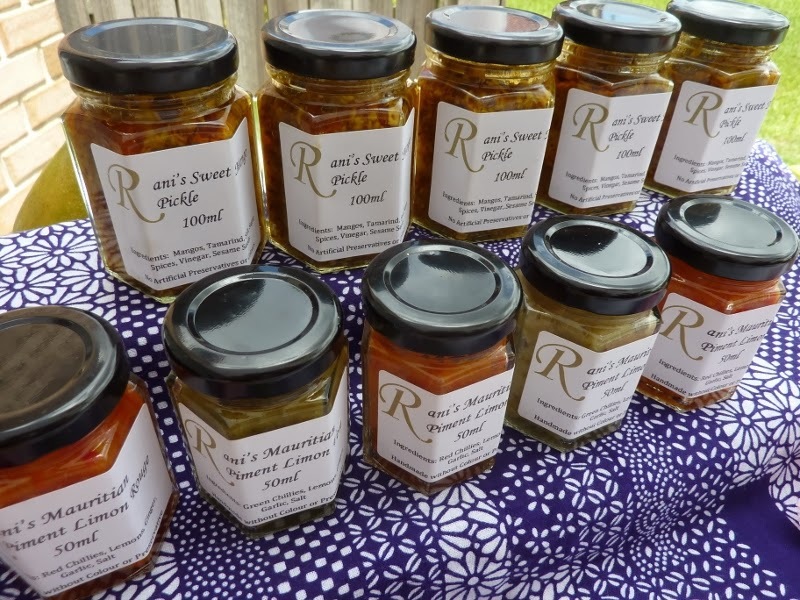 Products are currently available at Ingredients Deli Kenmore, Village Meats Rosalie and online via Mondoports International with plans for the products to be available more widely. The other thing to do is follow Rani’s Cuisine on Facebook or Twitter so you know when the next tasting party is happening – it’s a casual affair and everyone is welcome. At tasting parties, Pastes, Spice Mixes and Pickles all retail for between $6 and $8 so it’s the best way to try before you buy and cut out the middle man! I did all of my Christmas shopping in one hit at Ranee’s Tasting Party and if you’re very lucky, you may find a jar in your Christmas present. You will need to be lucky though as I find the Mango Pickle quite addictive so I’ve kept back a few more for myself. Since this post they've picked dozens more. I bought 10 jars of mango pickle alone so they need to keep up production. Mauritian food sounds amazing and I wish I lived within reach of Ranee's pickles. Love the idea of picking her own mangoes too. Hi Andrea – we bought up big on the curries too. Spiced but not spicy would be how I'd explain the flavours. Lots of mangoes everywhere in Brisbane – some years there are so many that the city council asks residents not to fill their rubbish bins as they are too heavy and break the trucks lifting them! Hi Maureen. Yes, I really like the approach Rani takes and she is wonderful to talk to. Perhaps I connected with Rani via you? Hi Fi. Just catching up with your posts. Rani's pickles and chutney sound amazing. I'm just reading The God of Small Things (India) but it reminds me of the pickle and preserve factory in the story. I'd love to go to one of the cooking classes if you are intersted. You missed out because you were travelling. I've read the God of Small Things, too but it's a while ago. Yes, perhaps when it cools down we should try to go to a class.